Beginning pool owners will focus their attention on all sorts of accessories for their pool. They’ll decide which ladder they like, which cover is the best and which pump is right for them. However, the one thing that few people give much thought to is the pool brush they are going to use on their pool. Which is unfortunate because it’s an important tool to consider. Why is a pool brush important? Because it’s a tool that can make or break your pool cleaning experience. Purchase the wrong one and you’ll have to work harder in getting the algae and scum off of the side of your pool walls. However, if you purchase the right one, then you can relegate pool cleaning to a small portion of your weekly activities. Of course, even the best pool brush won’t do you much good if you don’t properly use it. Fortunately, I’ve included a guide at the end of this article which will give you some tips about purchasing one of these tools. Before we get to that though, I would like to take a few moments and talk about some of the better brushes available nowadays. Once we’ve finished with that, I’ll give you some tips which will help you with your pool. Now, let’s get down to business. There are probably dozens of different brushes on the market today. Some of them are pretty good and some of them aren’t worth 2-cents. In order to help you find one of the better ones currently available, I’ve composed the following list. This durable and lightweight brush has an EZ-glide frame that makes it easier to push through the water. It has turned ends that make it easier to get the brush into corners. This brush is made from a heat treated allow that allows the frame to hold up to impacts. The bristles do a great job of getting scum and algae off of the side of the pool as well. Currently, this is only the brush and doesn’t come with the pole. With that being said, however, once it is attached to a pole it does a fine job at getting the pool sparkling clean. Designed to hug the floor and walls of your pool, this brush will make short work of even the toughest pool cleaning job. It has a spoiler shape that pushes water towards your pool’s surface with up to ten pounds of pressure but does it without making it harder for the user to push it. This brush is made from high-quality materials that make it tough and ensures that it will always maintain its shape. While it’s not designed for fiberglass or vinyl pools, on all other pools it does a pretty decent job of cleaning them up. With its unique blue, white and yellow design, this pool brush from Blue Torrent not only looks interesting but also does a good job at cleaning the algae, scum, and bacteria off of the floor and sides of just about any pool, except for ones made from vinyl. This 12-inch brush can be attached to a telescopic pole, which doesn’t include, and used to scrub dirt all around your pool. And when it’s done, it dries quickly and can be conveniently stored away in your garage or tool shed. Its 360-degree design is sure to make any pool cleaning job a whole lot easier. This unique aquatic brush kind of looks like a whale as it cleans the sides and floor of a pool. However, its tail isn’t really a whale’s tail, it’s more like the spoiler of a car. It allows the brush to be kept in contact with your pool’s surfaces so it can deliver up to ten-times the cleaning punch of conventional brushes. This brush is so good at cleaning and makes it so easy, some people have reported they have been able to clean their pool with just one hand. Which makes routine cleaning chores much easier to finish. 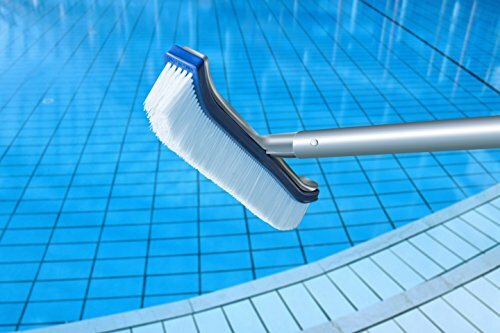 Although this brush is not supposed to be used on fiberglass or vinyl liners, because its stainless steel bristles will tear these surfaces up, on all other pool surfaces, this brush does a pretty handy job. When used on hard surface pools it does a great job of clearing away algae stains or mildew stains and has an 18-inch curved body that really hugs the surface of the pool. Before it can be used, however, it needs to be paired with an appropriate pole. Once that step is done, it’s ready to remove the dirt from your gunite or concrete pool surfaces. This large, 18-inch brush is designed to really clean the dirt, grime, and algae off of your pool’s surfaces. This 18-inch curved brush hugs the surface of your pool so it’s 1.5-inch bristles can scrub away the tough stains or sweep away the lighter stains that have accumulated on the walls and floor of your pool. If kept out of the sun, this brush should provide years of surface and is not only durable but lightweight as well. 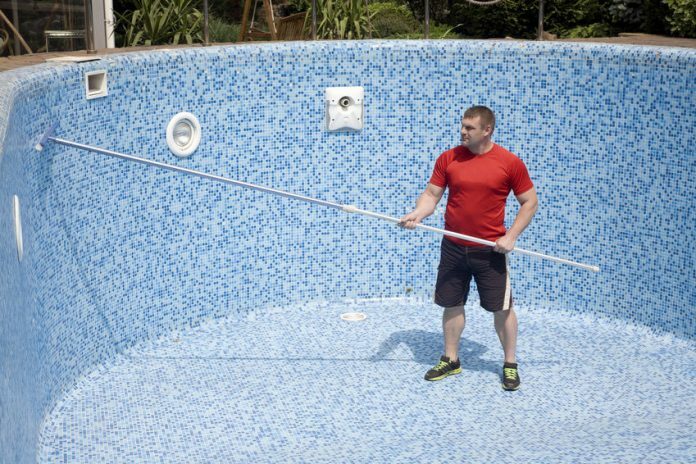 All that you have to do to enjoy the cleaning power of this tool is to pair it with an appropriate pole, preferably a telescopic one, and then you’ll be ready to get your pool back into tip-top shape. This small yet powerful algae brush is designed to scrub away tough stains on concrete and gunite surfaced pools. It’s not designed for vinyl or fiberglass pools because it’s stainless-steel bristles would destroy those surfaces. However, when used on the surfaces it was intended to be used on, it does a great job on small to a medium-sized work area. This 5-inch long brush can be used to clean the pool’s surface underneath the water or can be used on pavement and walkways. This model is made of aluminum and ABS plastic and will last a long time. Because this 10-inch wide wire brush has stiff wire bristles that are designed to clean algae away from concrete and gunite surfaces, it’s not a brush that’s supposed to be used on softer surfaces such as vinyl or fiberglass. However, when used on harder surfaces it really does a fine job. It’s made of ABS plastic and aluminum, for durability, and is nice and wide to cover a larger area of your pool at one time than smaller models. This tool, when used with an appropriate pole, will do a great job at restoring your pool back to its previous glory. And it can also be used on walkways and sidewalks as well. This pool maintenance kit is for pool owners who aren’t just looking for a brush but are looking for a whole system that will help them keep their pool sparkling clean. This kit comes with an 18-inch wall brush, a leaf skimmer, a scoop thermometer and a triangular vacuum head with a handle. It also comes with a dual test kit in a case. However, this kit isn’t perfect because it doesn’t come with a pole for the skimmer or the wall brush—that has to be purchased separately. Other than that design little point, this kit is almost everything a person needs to keep their pool in good operating condition. This 18-inch brush is designed to reach even the hard to reach areas of your pool and to get them as clean as possible. It can be used to clean corners, steps, ladders and even wood decks or tiled surfaces. This brush features corner brushes which give it a 360-degree range of cleaning. All that’s required to get the most out of this brush is to pair it with a pole that it will fit and you’ll be ready to get your pool back in tip-top condition without a whole lot of elbow grease. Now that we’ve gone over some of the more popular brushes available, let’s take a few moments to talk about how to properly choose a brush for your pool. Not every brush is good for every pool and in some cases, choosing the wrong brush can lead to your pool’s walls and floor becoming scratched. Which is why it’s important to take the following things into consideration. The first thing you’ll want to take into consideration is the size of your pool and the size of your brush. If you have a large pool, then you are probably going to want to go with a larger brush—like an 18-inch brush or larger. However, if you have a smaller pool or have a pool that doesn’t require a lot of cleaning, then you can choose a smaller sized brush. Just remember that brushes which come in the 5-inch range are usually only good for spot-cleaning and not for cleaning large areas of the pool. Another thing to keep in mind is the material the bristles of your brush are made from. A stainless-steel brush is good for removing heavy-duty stains from concrete and gunite but it will absolutely destroy vinyl and fiberglass pools. Always choose a nylon brush for these type of pool surfaces to avoid scratching them up. If you’re unsure of what type of brush to get, nylon is also a pretty safe bet. The size of your pool is another important factor to consider when purchasing a brush. Some brush shapes are better for some pool shapes. For square pools, I’ve noticed that rectangular brushes seem to work the best. For round pools, I’ve found rounded brushes do the best. Of course, this part is mainly personal preference, so just be sure to choose one that fits your cleaning style. One thing prospective brush buyers need to keep in mind is that most brushes don’t come with poles. The poles are something that usually has to be purchased separately. I know many pool owners who bought brushes only to be disappointed that they didn’t come with a pole—that it was something that had to be purchased separately. Here are a few final tips that will help you get the most out of your pool cleaning. It doesn’t matter if you’re using a grout cleaning brush or some other type of brush, following these tips will help you get the most out of the tool you’ve chosen. You should make sure that you brush the sides and the floor of your pool at least once a week. With the proper brush, the whole process should take under 20-minutes to complete but it’s well worth it. Some people like to brush their pool twice a week, but I don’t think that’s necessary. Just brush it once a week and skim it once a week and your pool should be good. If you have an automatic pool cleaner, then you might not even have to brush it this much but it’s still a good idea to give your pool a good brushing down every once in awhile. Another thing that will keep your pool in good condition is making sure that it always has the right amount of pool chemicals in it. Too much or too little can really upset the balance of your pool and make it harder to clean. Now that we’ve covered some of the better brushes on the market, have talked about what to look for in one of these cleaning tools and presented you with some cleaning tips, I think it’s time for me to conclude this article. And I’ll do so by telling you that brushes for pools aren’t as unimportant as some people think they are. In fact, as you found out, they are one of the most important pool cleaning tools that you can use. Just be sure to use it wisely.